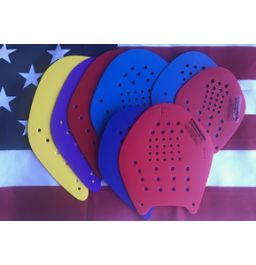 Strokemaker™ Swimming Hand Paddles, these are the original stroke technique paddles. 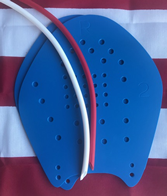 Designed to improve technique and increase strength in the swimming specific muscles while reducing the pressure on the shoulders, these are the paddles used by the majority of the top swimmers in the world. 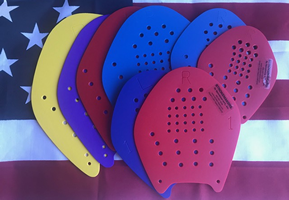 The newest version of the original strength and technique improving Strokemaker Hand Paddles!! Star Spangled Strokemakers come with 2 complete sets of tubing that you can mix and match in fun color combinations. They also come with 20 water proof star stickers for customizing on the front and back! Same great stroke and strength improving design! 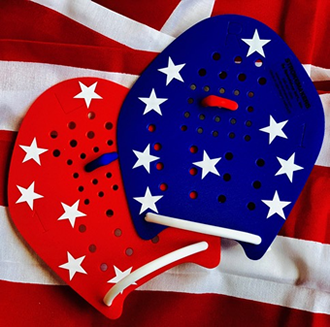 Makes a great gift for any swimming enthusiast! Strokemakers were designed to be “oversized,” building strength and helping correct stroke faults,. The hand should fit completely on the paddle with the thumb and first finger near the edge and the pinky should have some space on the outside edge. The hand being slightly offset allows for fully finishing the stroke and the outer edge water foil builds strength without putting pressure on the joints Age and experience are two factors listed, but hand size in relation to the paddle is the primary way to determine the correct size. Most swimmers drop down 1 to 2 sizes from their freestyle size for fly/back/breast as well as during taper. Going up a size or two for drills is also very beneficial to emphasize proper technique and to work on maximum distance per stroke. The sizing suggestions listed can also help with choosing a size. 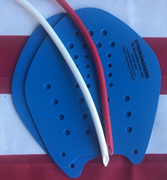 Size 0.5 - Blue For 8-11 year old age-groupers, female masters, synchro, and all ages finger tip paddles or higher tempo drills. Everything you love about the original, in new colors and material. Flexible, buoyant and now more resilient. Size 1 - _Azure Blue/Navy&Red For 9-13 year old age-groupers, high school girls and stroke swimmers, female masters and triathletes, synchro, water aerobics/rehab and high tempo drills. Everything you love about the original, in new colors and material. Flexible, buoyant and now more resilient. Size 2 - Yellow/Blue For older age-groupers, younger high school boys, older high school girls (freestyle), college men (strokes)/women(free), masters, triatheletes, synchro and water aerobics/rehab. Everything you love about the original, in new colors and material. Flexible, buoyant and now more resilient. 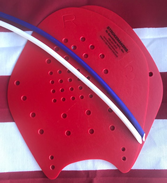 Size 3 - Red For senior national level girls, older high school boys, strong college women (free), college men (free/stroke), male masters/triathletes, synchro, water aerobics/rehab and body surfing. Everything you love about the original, in new colors and material. Flexible, buoyant and now more resilient. 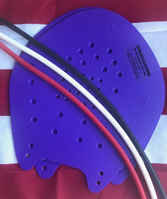 Size 4 - Purple For senior national level men, college men, very strong college women, advanced male triathletes/masters, technique and cycle count drills for advanced swimmers, water aerobics/rehab and body surfing.